The summer before her senior year at Bowdoin, Kaitlynn Miller ’14 had a once-in-a-lifetime opportunity. Miller, who grew up in Vermont, received a grant from the National Science Foundation to work on a research project in Alaska. She’d be based out of one of the world’s premier Arctic field stations—a remote site seven hours from Fairbanks on the road truckers drive to the Prudhoe Bay oil fields. There was one problem: Miller was a member of Bowdoin’s Nordic ski team—and the summer is a critical time for endurance training that pushes ski racers to their best performances in the winter. Alaska would deprive Miller of key ingredients in a well-rounded training plan, like a fully equipped gym or even hills she could run—not to mention working out with teammates. Miller was a star on the team. She’d already become Bowdoin’s highest-placing woman since the school started competing at the elite Division I level. But she hadn’t wanted skiing to be her life’s main focus—she was thinking about studying to be an Arctic ecologist. Many high-level coaches would have balked at an athlete planning a summer at a remote field station, but Miller’s coach at Bowdoin, Nathan Alsobrook ’97, embraced her plans. Miller set off for her Alaska summer with training ideas from Alsobrook, along with a shaving cream can-sized device called an Exer-Genie. It would hang from any door: Miller could train by pulling a rope through it to strengthen her arms. That creativity, flexibility, and persistence has long been a hallmark of Bowdoin’s crosscountry ski team. With her coach’s endorsement, Miller’s summer in Alaska did not derail her skiing career. And her subsequent athletic accomplishments parallel successes for Alsobrook and the whole Bowdoin team, which for the past decade has steadily pushed itself up the ranks of the competitive East Coast ski circuit. Last year, three Bowdoin cross-country skiers qualified for the NCAA national championships—its largest group ever. Jake Adicoff ’18 won a silver medal at the Paralympic Games in South Korea in a race for visually impaired athletes. And Miller? Two years after winning her first national championship, she made the US Olympic team last winter. But not before she had to employ some creative training techniques at that Arctic field station. When Miller was deciding where to go to college, cross-country skiing wasn’t her biggest priority. And in a way, she chose Bowdoin in spite of its ski team. Head Coach Nathan Alsobrook ’97 encourages Kaitlynn Miller ’14 during the 10k freestyle race at the Colby Carnival in January 2014 at Quarry Road in Waterville. Photo: @flyingpoint.com. Over the years, the program managed to attract successful athletes sporadically. But many of those athletes came with a common thread: They didn’t want sports to be at the center of their college experience. The current team conducts many of its workouts off campus, on roads and trails in rural parts of Brunswick and Topsham. While some schools have their own dedicated ski areas, it’s only in the past fifteen years that Bowdoin athletes have had regular access to professionally designed trails. Even now, their winter ski workouts are a thirty-minute drive from campus at Pineland Farms in New Gloucester. Before that, the team made do with multi-use trails in Topsham, groomed by a coach on a snowmobile. “We had our whole team pitch in, early in the season. We’d be out there with pulaskis and pulling out roots and stumps, getting those trails ready to go,” said Bill Yeo, who coached at Bowdoin between 1994 and 1999. Cross-country skiing presents an unusual set of physiological demands. It requires heavy full-body strength work, plus long workouts for endurance. Then there are lung-busting sets of hill repeats and higher-speed ski workouts. Ryan graduated from Bowdoin in 1998 and knew some skiers as a student, but he’d never seen a competition until he returned to the College as a staff member. He came away with a deeper appreciation for the sport. While the sport calls for tenacity, practically everyone associated with Bowdoin skiing will also tell you the team has always emphasized fun—even when it lagged in race results. Yeo, a mountaineer and adventurer when he wasn’t coaching, took his athletes winter camping. Today, an annual Quebec training camp includes a team-cooked Thanksgiving dinner. Alsobrook skied under Yeo in the 1990s, after growing up in northern Vermont. Alsobrook’s friends describe him as goofy, folksy, and thoughtful, if not an especially gifted athlete. One teammate and longtime friend, Nicole Wobus ’97, said she always thought Alsobrook would be a writer—he graduated from Bowdoin with a degree in English. Yeo remembered Alsobrook constantly wearing plaid flannel shirts and having an appetite for junk food that teammates needled him about. Skiing was barely a focus for Alsobrook when he arrived at college. “The thing that I’m proud of as a Bowdoin skier is that I went from being completely terrible to being a solid mid-pack guy,” Alsobrook says. For nearly a decade before Alsobrook arrived back in Brunswick in 2007, Marty Hall, a former US and Canadian national team coach, ran the Bowdoin team. Hall had stepped away from highlevel competition and wanted to get back into coaching, though he wanted a job that wasn’t as all-consuming as work at the international level. 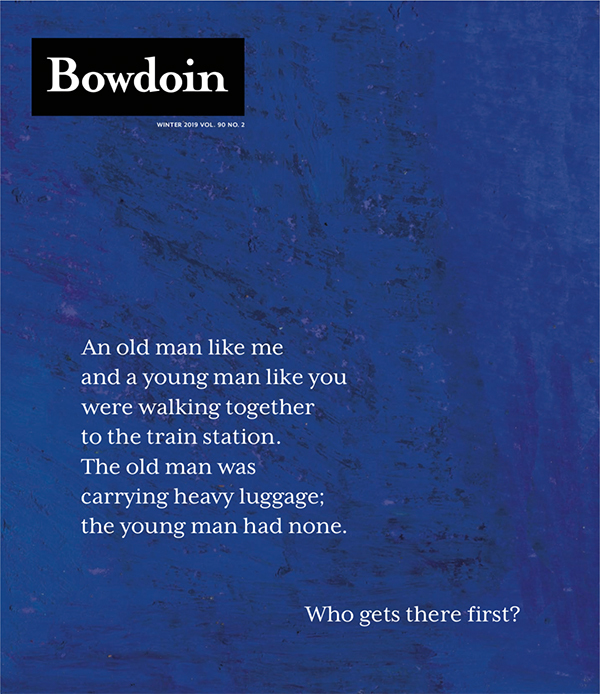 By the time he got to Bowdoin, Hall was in his sixties. He’d been a three-sport athlete at the University of New Hampshire—football, skiing, and track—and served in a special military unit in Alaska that trained athletes in biathlon (skiing and shooting). Accordingly, he brought a level of bluntness, sharpness, and crustiness best summed up by his reaction to a certain strength test that he administered in the Bowdoin weight room. Hall’s demanding style worked better for some than it did for others. But no one disputes that he was a relentless advocate for the team and dedicated to his athletes, even though few went on to race at the level of the skiers in his past. Alsobrook’s approach to the sport is as serious as that of any of his peers. But his skiers and friends say he still coaches with a kind of quiet consistency and a dry sense of humor that leaves his athletes feeling unpressured. When Kaitlynn Miller came to visit Bowdoin in 2009, the school was not at the top of her list. She didn’t even contact Alsobrook on her first visit. And when she came back to meet with him, she found him sharing an office with the volleyball coach. Miller describes herself as a “quieter person”— her non-skiing hobbies include knitting and painting—and she appreciated that Alsobrook’s idea of a meeting was talking on a walk around campus. She found that her ideas about balancing skiing and college aligned with Alsobrook’s. “It wasn’t one over the other,” she said. “I kept reminding myself that the success of the team wasn’t why I was choosing a college. The academics were what I wanted. The coach was what I wanted,” she said. “The building blocks were there to support me.” And that’s why when Miller found herself plotting her summer in Alaska in 2013, she had the backing of her coach. When she arrived, it turned out that their plan required some changes. There was only one road running past the field station. Miller had hoped to run on it, but it turned out that it was under construction from early in the morning to late at night. Instead, she ran on the camp’s one-mile access road—often wearing a full bug shirt to fend off hordes of mosquitoes. The rest of the people at the field station “thought I was a little nuts,” Miller said. Then, when the indoor treadmill broke, she did her interval sessions on an elliptical machine. “Which was awful. But it was totally worth it for the experience of being up there,” she said. Last year, Bowdoin sent three skiers to the championships for the first time: Ketchel, Gabrielle Vandendries ’21, and Renae Anderson ’21. The program’s success has presented Alsobrook with a dilemma: He’s had to start cutting people from the team. And he admits that the eighteen-year-old version of himself wouldn’t be able to make it today. “I would not even be close,” he says. He’s worked hard to make sure that the team’s improvement hasn’t come at the expense of fun—what he describes as the team’s “soul.” And his athletes say he’s succeeded. "He’s incredible at making sure people are just happy at Bowdoin, as opposed to just skiing fast. " Winning the Chummy Broomhall Cup (Maine State Championship) for the first time ever. Elliot Ketchel ’21 and Gabby Vandendries ’21 were state champions (that picture from Steve is Elliot skiing down the finishing stretch at the Chummy with the Bowdoin flag). Fourth-place finishes (for Nordic teams) at the Middlebury Carnival and the Bates Carnival (Eastern Regional Championships)—the team's best ever carnival finishes. Seventeenth place team finish at NCAAs—Bowdoin's best ever. Renae Anderson ’21 and Elliot Ketchel ’21 qualified. Elliot’s sixteenth place finish in the 20k classic event is the best NCAA finish ever for a Bowdoin male cross-country skier. Nathaniel Herz ’09, a former Bowdoin Nordic skier, is based in Anchorage, Alaska, and covers the environment for Alaska Public Media’s Energy Desk. He spent several years as a reporter at the Anchorage Daily News and has reported on cross-country ski racing and biathlon for FasterSkier.com. Tristan Spinski’s photos can be found in Audubon, Newsweek, Rolling Stone, The New York Times, The Wall Street Journal, and many other publications. He lives in Portland. View more of his work at tristanspinski.com.